In our previous blog post here at A & C Sprinkler, we went over some useful ways to save money and keep your home warm during the harsh and brittle temperatures of winter here in Toms River. Above just about all else, the most important thing that you can do to protect you and your property against the forces of Jack Frost is to get a sprinkler blowout from our irrigation systems specialists. 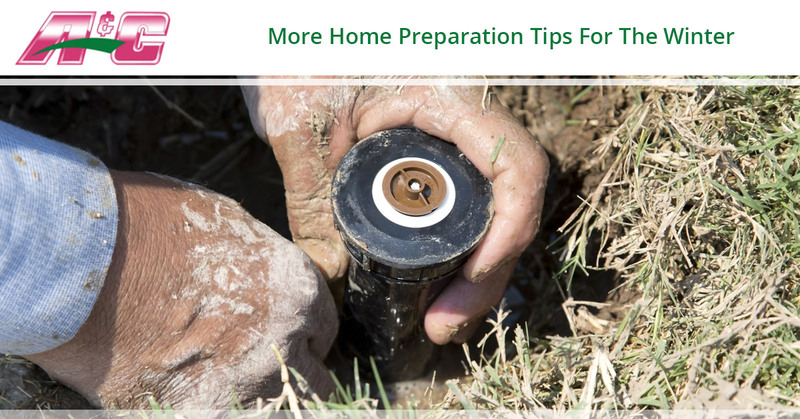 This way, your pipes, valves and sprinkler heads will not freeze, leaving you with a functional sprinkler system for the spring, summer and fall months – when watering your lawn really matters. Despite the importance of our sprinkler blowout services, there’s a lot more that you can do to winterize your home and stay comfortable inside without paying an arm and a leg on your heating bill. We’re going to continue going over a few useful winterization tips for your home in today’s blog post, but don’t forget to contact A & C Sprinkler for all of your irrigation needs here in Toms River! No, this doesn’t mean that you have to take cold showers this winter. In our last blog, we mentioned insulating the hot water heater unit itself, but manually lowering the temperature is something you can do to instantly save money on bills. Hot water heaters are typically set at 140 degrees, so lowering it down to about 120 degrees will still be plenty hot enough for bathing, washing clothes and doing dishes. If you have any exposed or uncovered windows in your home, cold will leak through. Muffling the cold drafts with window coverings like thick curtains, drapes and shades will go a long way to save some money on heating costs. Draw window coverings at night and when you’re away to conserve heat in your home. However, when the sun is out – even during the peak of winter – open your window coverings to let the natural heat into your home. If your home has an attic, consider insulating it. Insulation keeps warm air inside your home during the winter and expensively cooled air inside your home during the summer. So, this is an investment in your home that pays off during all times of the year! Admittedly, this might not be our cheapest home winterization tip, as a professional usually does this job. But like we said, the payoff occurs during all parts of the year, and you can also find certain rebates and financial incentives to make this home improvement project just a little more cost effective. The last thing that our irrigation systems specialists want to see is homes that waited too long to do a sprinkler blowout. We also dislike seeing our neighbors pay more on their heating bills than they have to, so why not do both and get on top of your sprinkler blowout this year? Don’t say that we didn’t warn you! Schedule a sprinkler blowout today to prepare your home and property for a smooth, comfortable winter season.